Got your heart set on booking a fall festival this year? Check out these six amazing opportunities on Sonicbids for independent bands. Deadlines are fast approaching, so get on it now! Festivalgoers last year were treated to performances from the likes of Charles Bradley, Explosions in the Sky, and Of Montreal on two alternating stages in a gorgeous open-air setting at the 1,000-acre Four Sisters Ranch. The 2016 edition marks the eighth UTOPiAfest. The lineup hasn't been announced yet, but will surely be as diverse and impressive as years past – and there's room for up to three Sonicbids artists to get on the bill. Application details: Compensation ranges from $100 to $500. All genres considered; original music only. Submit your application for $5 here. Billed as "the most heavily attended back-to-school event in New England," this one-day fest at Fenway Park often features bands and artists with ties to the area, like Berklee alumni. Acts from beyond Boston have also graced the bill, though: Wale, who hails from D.C.; Nashville's Sam Hunt; and We The Kings from Florida, to name a few. Application details: Compensation is $100. The fee is $10 to apply for this one, and they're looking to book four bands through Sonicbids. Check out more details here. This one's huge, you guys. More than 400 artists present at this internationally minded five-day event, which has more than earned its cred as an industry staple since first launching in 2002. Past performers are pretty staggering – think Patti Smith, Beck, Joanna Newsom, Shuggie Otis, Chromeo, Tokyo Police Club, A-Trak, Arcade Fire, Interpol, Ty Segall, Grizzly Bear, The Dream, David Byrne & St. Vincent, and Nick Cave. 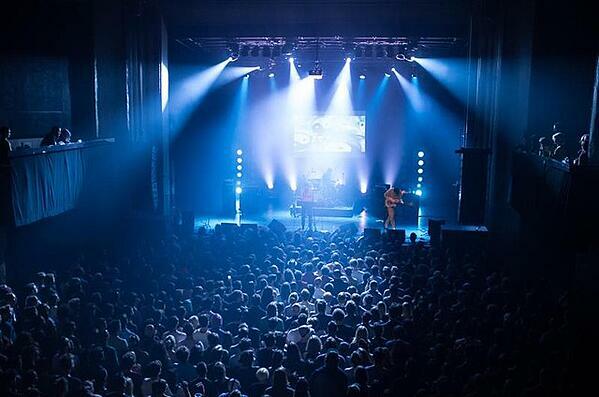 POP Montréal draws about 50,000 attendees each year, so it's smaller than SXSW, but it's continually growing. Like the Austin fest, though, it's more than just music. There are symposium discussions, film screenings, art exhibits, and late-night parties, all of which are attended by industry folks as well as fans and artists. Application details: They're holding 65 spots for Sonicbids artists who'll receive between $100 and $500 as payment, plus festival passes and access to catered grub. The cost is $30 to apply. A slew of promoters book hundreds of musicians at more than 40 venues at this five-day event, which reached upwards of 50,000 in attendance last year. Rising artists are a focus; slated for the 2016 edition is an eccentric array of up-and-coming acts from England and the rest of the world. Application details: Three Sonicbids artists will be considered for three to five shows (each is two 45-minute sets). Those selected are responsible for their own travel costs, but there's performance compensation, a per diem provided for each musician, accommodations (with breakfast) provided for international acts, and UK work permits provided for non-European musicians. Apply for $10 here. At this three-day fest, independent bands and artists of all genres compete for prizes like music videos, studio time, and equipment rental vouchers before industry professionals and music fans. Videos and films are screened between bands and compete separately for their own buffet of rewards. Application details: For their ninth go 'round, they're booking 10 Sonicbids artists. The fee is $10. This free, family-friendly Austin tradition is the largest art festival in Central Texas, attracting over 300,000 people. The three music stages showcase emerging bands in the Austin area, as well as acts touring through the city during the fest. Application details: Five artists are being booked through Sonicbids for the 36th annual festival, each of which will be compensated at least $50. The application fee is $10.